Last month, I got a jolt. I wished an old friend “Happy Birthday” two days before activity on her Facebook wall indicated that she was dead. Not only dead, Ada had been dead for two years. I was numb. Then I checked instagram, to try to buzz another old friend and be the first to wish him a Happy Birthday at midnight, only to see that he has cancer and was in need of funds for his second chemotherapy session. I have since reached out to tried to create awareness verbally, as well as donate a small token myself. I am happy to report that he has finished his chemotherapy session and is clear. We hope he remains a cancer survivor and never goes into remission. 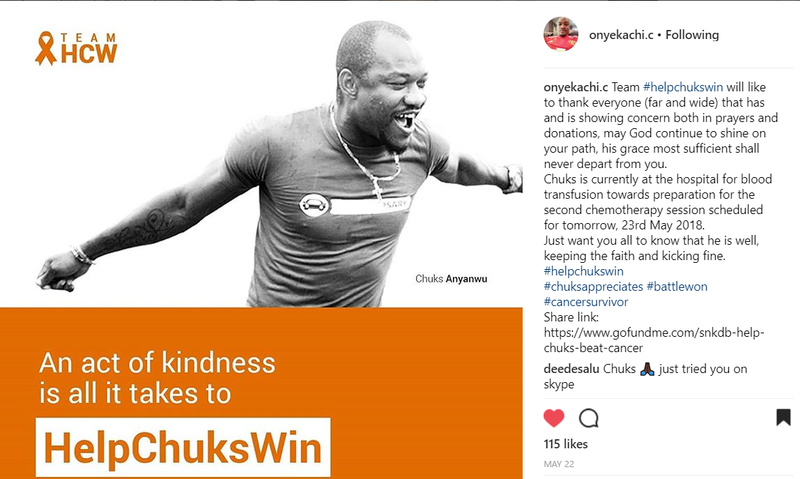 Please join us in prayers that Chuks will continue to win over this situation. Moral of this story: Reach out to your friends once in a while, especially old ones that you hardly hear from. Say hello and actually solicit a response. You never know what they may be going through. And I hope its not too late, like it was for Ada.